Let me make one thing abundantly clear: I love the concept of powered loudspeakers. I absolutely support their adoption. Over the years, I’ve owned as many powered loudspeakers as I have passive ones, though admittedly I’ve had to resort to purchasing either Bang & Olufsen products or professional monitoring/mastering loudspeakers, since using the word “powered” in audiophile and home theater circles is sacrilege. But why!? Why is the concept of powered loudspeakers so taboo, when they offer up so much by way of performance, features, and convenience? My hunch is that by taking some of the equipment out of the equation, enthusiasts believe they’re somehow missing out on an opportunity to tune or better their setups through mixing components. This honestly has to be the only reason, for all other arguments to the contrary fall apart, and quickly. Think about for a moment: A lot of powered speakers are bi-amped (or even tri-amped), meaning there is an internal amp for each driver within the cabinet. This ensures that each driver has the requisite juice to perform its level best. Can’t say that about a lot of passive speakers using simple stereo or even monaural amplifiers. Next, they often have built-in DSP and even EQ capabilities; not to mention multiple inputs, DACs, and often wireless connectivity options. I can go on, but I can feel die-hard enthusiasts sharpening their pitchforks with each keystroke. Make no mistake, the future of audio and video is wireless, and powered speakers are but a stepping stone towards that inevitable future. And this is a good thing–something to be embraced and not feared. 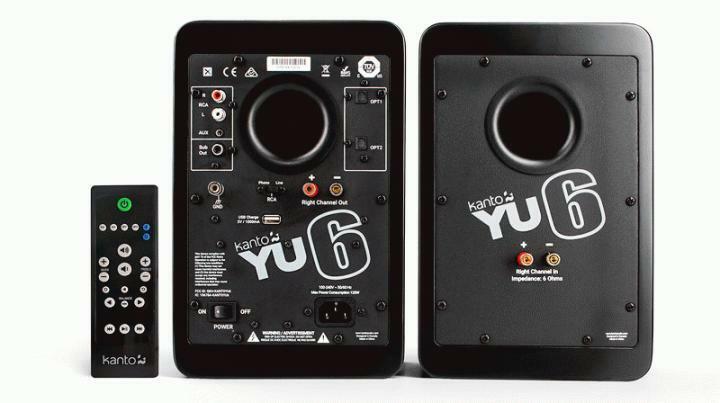 As such, I jumped on the opportunity to review Kanto’s YU6 powered monitor with its matching subwoofer, the SUB8. Admittedly, I wasn’t at all familiar with Kanto prior to their arrival, though I had seen them in a few record shops here in Austin. For $ 399 retail and sold online as well as in stores, the YU6 is nothing if not a phenomenal hi-fi value straight away. Throw in the SUB8, which is sold separately for $ 289.99, and you have yourself one hell of a 2.1 setup that requires little more than a flat panel display or turntable (or both) to be considered a complete audiophile or 2.1 channel home theater system. The YU6 is a two-way bookshelf design that comes in a variety of stylish colors, ranging from matte white to bamboo. 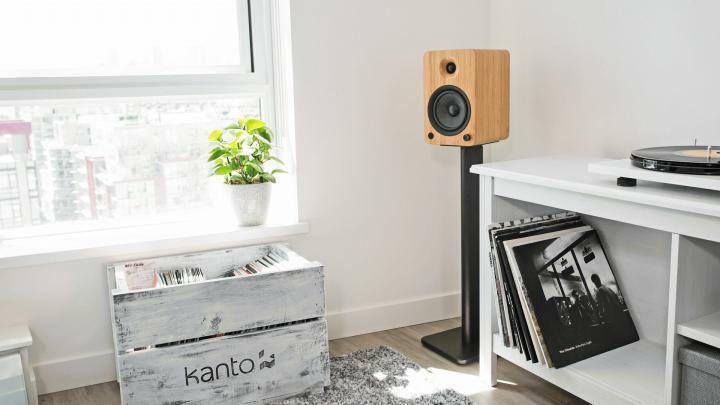 In total there are seven finishes from which to choose, and all go a long way in helping the YU6 stand out from other bookshelf speakers (passive or powered) in its class. My review pair was clad in matte white, which when coupled with the speaker’s rounded corners and exposed black drivers, looked positively modern. The front of the “main” YU6 differs from its sibling, but only just. For starters, both speakers feature the same one-inch silk dome tweeter and 5.25-inch Kevlar bass/midrange driver. The main speaker has a small circular display window in the lower left corner, and in the right a small flat black knob, which controls the system’s volume (unless you include the remote). The main speaker houses all of the amplifiers and electronics, effectively making the other a passive bystander. This is evident when you turn both speakers around and find one packed with connection options whereas the other possesses but a single pair of binding posts. For those unfamiliar with powered loudspeakers, the back of the master YU6 looks a lot like the back of a powered subwoofer. The entire back looks more or less like a subwoofer amplifier plate–albeit with a lot more connection options. The back of both speakers is dominated by the large, centered bass reflex port, which no doubt helps the YU6 achieve its stated low frequency extension to 50Hz. To the left of the port there is a pair of analog audio inputs (RCA), as well as an auxiliary audio input (stereo mini jack). Below that is a single subwoofer out, followed by a phono ground. To the right of the phono ground you’ll find a simple selector switch that toggles the aforementioned analog audio input from line input to phono. Yes, the YU6 has a built-in MM phono stage, which I’ll talk about in a moment. To the right of the switch is a small pair of five-way binding posts that are not standard in their appearance or size when compared to the posts you’ll find on the back of an AV Receiver or pair of passive speakers. That being said, they do accept bare wire, spade lugs, and banana-terminated speaker cable. The binding posts are there so that you can use the included speaker cable to connect the main powered YU6 speaker to its passive sibling, thus cutting down on cable clutter. To the right of the bass reflex port there are two optical inputs. A five-volt USB input (for power only) and IEC power receptacle round out the YU6’s physical connection options. As for its wireless input option, the YU6 features Bluetooth with aptX. All the necessary cables, including power, speaker, and auxiliary analog, are included. As for the SUB8, which I’ll only go over briefly: It features the same visual styling as the YU6 monitor, although at present its finishes are limited to matte white and matte black. The SUB8 measures roughly 11 inches cubed and tips the scales at a hair over 17 pounds. It features an eight-inch driver mated to a 250-Watt Class D amplifier. It’s reported frequency response is 35Hz to 175Hz, so it’s not going to rattle your house off its foundation, but it dips low enough to round out the YU6’s bottom end. As for inputs, there is a single line level (RCA) input. Controls include a phase switch (0/180 degrees), variable low-pass filter (40Hz to 120Hz), and variable level dial. Which brings me to the remote. Yes, the YU6 has a remote and it’s substantial in both its construction and its capability–though the latter does require a bit of deciphering. First, the input buttons are ungodly small and not easy to read in anything but bright light. Volume controls are clear as day, but bass and treble adjustments aren’t the most intuitive. Yes, there are bass/treble up and down, but you don’t ever really know how far you’ve gone past center unless you yourself keep count. Each has its own reset button, though it isn’t labeled as such. Yes, the remote is functional, and yes, it’s well-built, but it’s not the most fun to use. 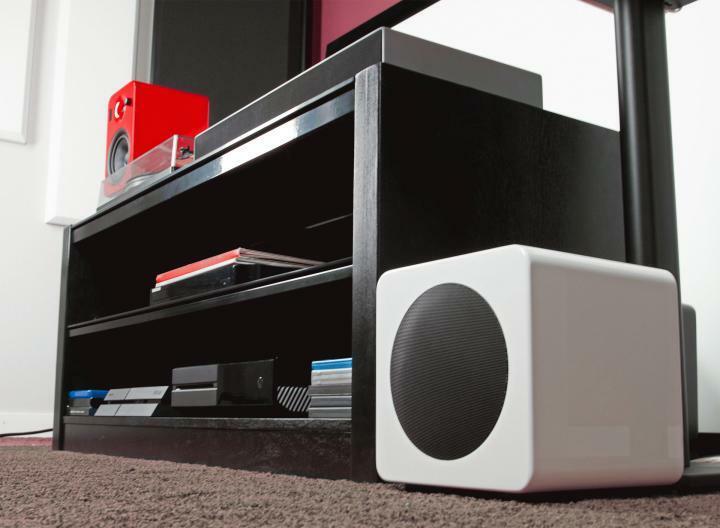 There are more than a few ways to integrate the YU6 into your home and/or existing system; as a standalone setup, meaning a pair of YU6 speakers and a sub connected to either your turntable or source component (or both); as a replacement for your TV’s internal speakers, or as part of a multi-channel surround sound setup. To incorporate them into a 2.1 home theater you either need to connect them to your TV via analog or TosLink, and set the TV’s internal speakers to off, which will make the YU6 operate the same as you would expect a soundbar or the TV speakers themselves. To use the YU6 in a multi-channel setup, you need to make sure your AV receiver’s preamp outs, or just use a dedicated preamp/processor (preferred). Note that you’ll be connecting the left and right channels to one YU6 and using speaker cable to extended the signal to the to the other speaker. This is true for the rear channels as well, should you choose to connect another YU6 pair. I utilized the YU6 and SUB8 in each of the aforementioned configurations and found the system’s sound to be, more or less, the same regardless of how I chose to enjoy the speakers, so what follows will be a summation of the YU6 and SUB8’s sound overall, unless otherwise specified. 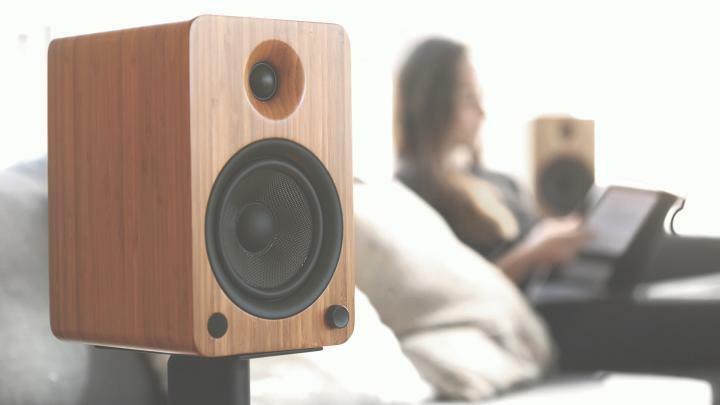 Also, while the YU6 may be versatile and stylish, proper speaker and subwoofer placement is still important to extract the most performance from them, or any speaker–powered or passive.